Have you ever needed a costume at the last minute? Or do you really like cats and want to dress up as one for Halloween? Either way, it is super easy to dress like a cat. 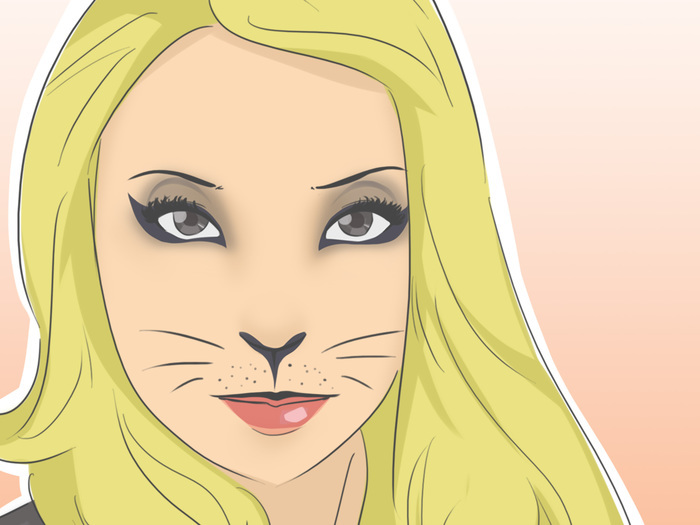 With a little bit of makeup and costume preparation, you can easily make your own cat costume and be the cutest cat at the party. Put on base makeup. 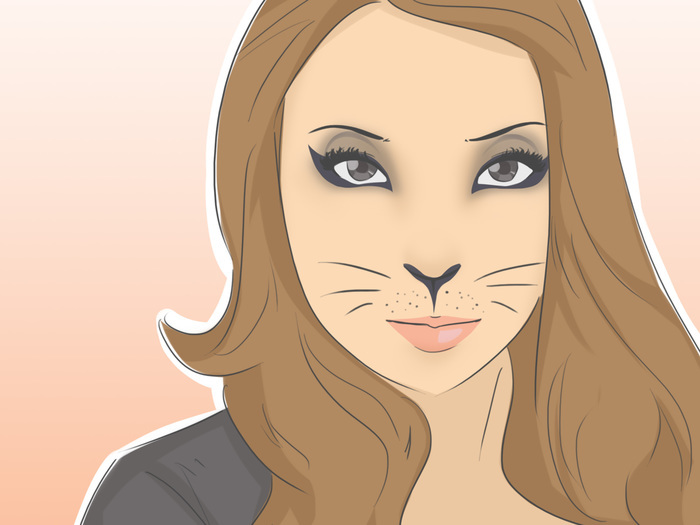 To start off your cat makeup, you need to put on the foundation and powder that you wear on a day to day basis. This will set the tone of you skin and make your face even and receptive to your cat makeup. If you want to take your makeup one step further, you can cover your face in the color that matches the kind of cat you want to be. For instance, if you want to be a black cat, try painting the main part of your face white and the area on the outside of your face black. 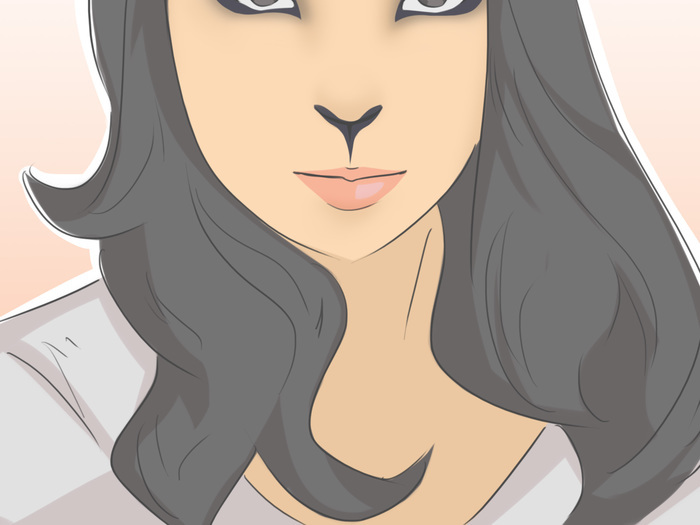 The white area will allow you to paint on the cat features better and the black adds dynamic color changes in your makeup. Outline your upper eye lid. Once you have on your base makeup, you need to start your cat eyes. Get your favorite brand of liquid black eyeliner. Starting from the inside of your eye, line your upper lash line with the black eyeliner. Once you get to the outer edge, make a small wing out to give you a cat eye shape. Repeat on your other eye. This will be the base of the bottom eye makeup, so it can be as dramatic or as subtle as you want, depending on how you want your eyes to look. Make sure the wings you draw are as even as possible. You don't want your face to appear uneven. If you don't have a liquid eyeliner pencil, you can use a normal eyeliner pencil. Make sure you sharpen it well so it will give you the same thin, crisp line as the liquid eyeliner. Apply eye shadow. On your upper lid, pick a subtle color that is complementary to your skin tone. Cover your lid with the color you choose, applying it high enough that you can see it when your eyes are closed and out as far as the wing of your eyeliner. Repeat on the opposite lid. Gold, bronze, brown, light purple, beige, or a shimmering white are good complimentary colors that will contour your eyes and add depth to the cat eye effect. Finish your eye. Now it's time to finish the cat eye shape around your lids. Start from the edge of the line you made on your top lid. 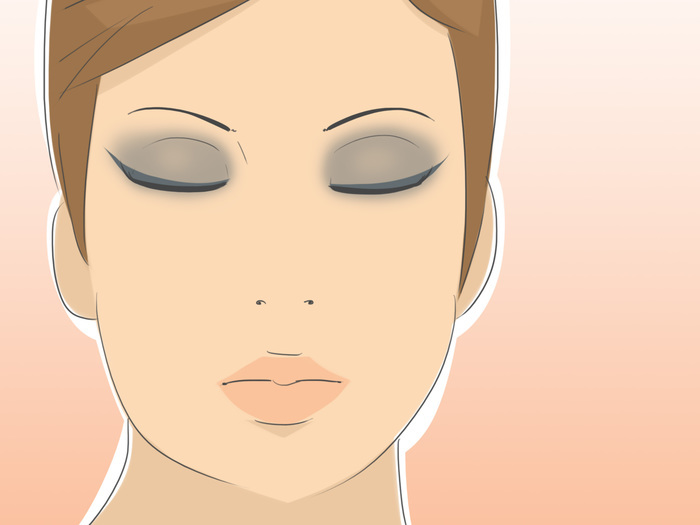 Draw a small line down just past your lower lid along your nose, following the angle of your eye. Next, connect the end of this line to the edge of your lower lash line, making a small triangle shape. 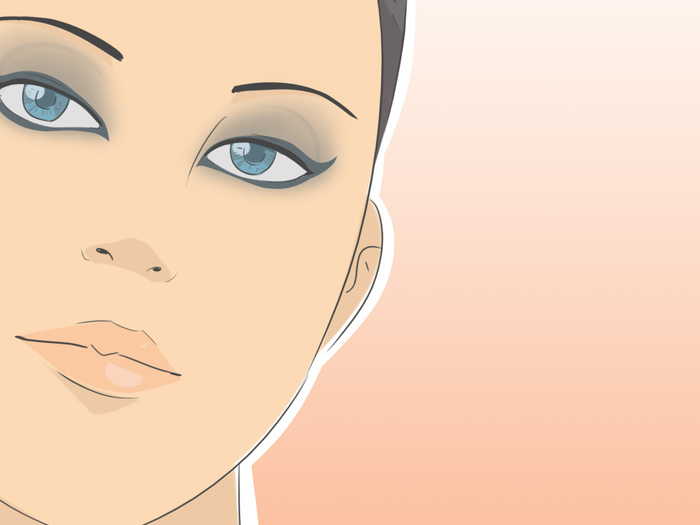 Then, line your lower lid close to your lashes, drawing a wing downward on the outer edge to match your upper lid. You can also connect the lower wing to the one on your upper lid. This gives you a more angular cat eye. You can also add some darker eye shadow below your lower lash line to give you a smoky eye. You can also accomplish this by making your lower lash line thicker and then smudging the edges of your eye liner. Prepare your lashes. Using an eyelash curler, curl both your eyelashes. Apply a generous layer of mascara to both your top and bottom lashes. Repeat on your other eye. This gives you that mischievous, sneaky look that cats have. 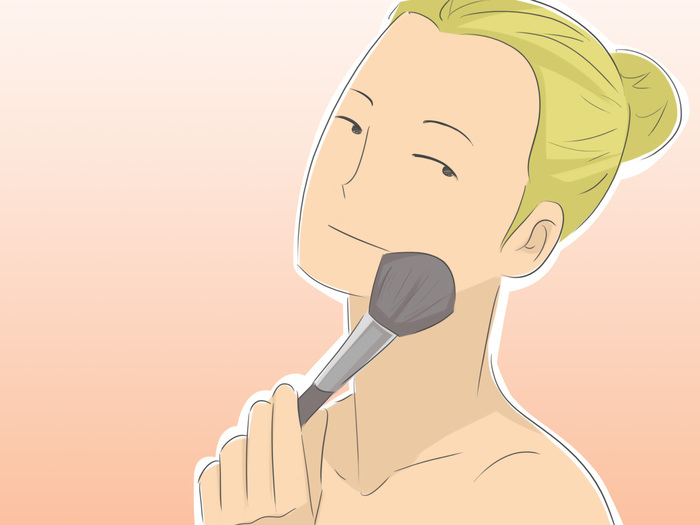 If you want, you can also skip this step and use fake eyelashes instead. Apply them like normal, making sure to not mess up your other makeup. Paint your nose. Now that you have the cat eyes, you need to make your cat nose. 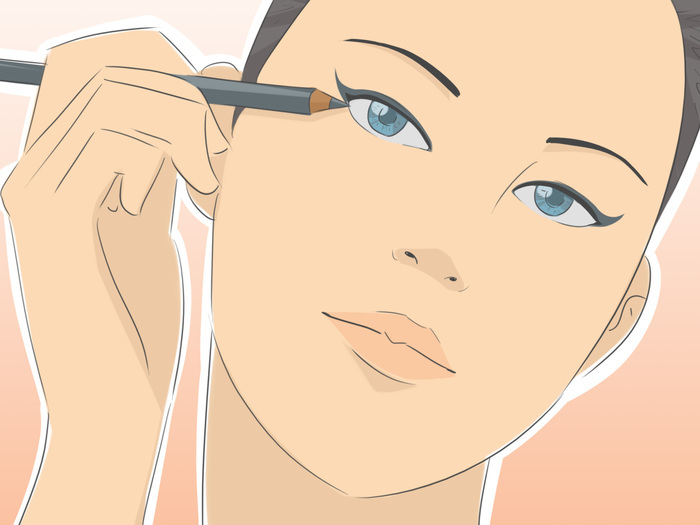 Using waterproof eyeliner, fill in the skin around your nostrils on the underside of your nose. Following the contours of your nostrils, color around the upper edge of your nostrils. Once you're done filling your nose in, draw a small, straight line down to your lips from the middle of your nose. 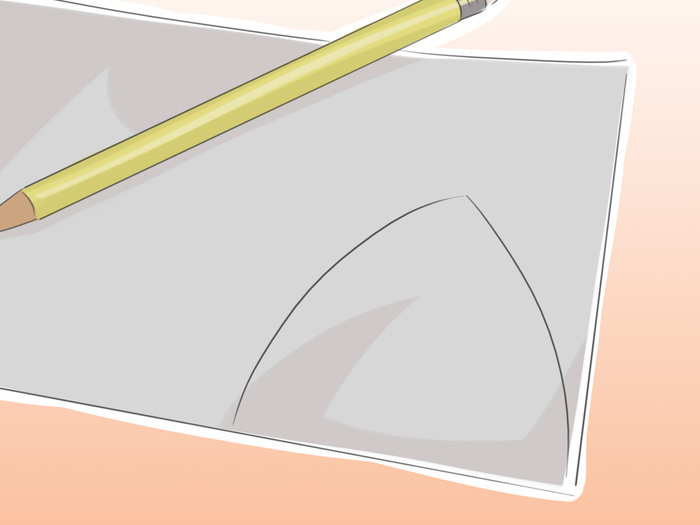 Make sure you keep the slight dip in your nose as you draw along the top edge. This makes it look more natural. If you don't want to fill in all of your nose, you can make a slight handlebar along the outer edge below your nostrils, which will give the hint of a cat nose without the excessive use of makeup. You can also go traditional and draw a simple triangle on your nose. It's not as elaborate as the other nose but it does create a cute, simplistic look. Draw your whiskers. 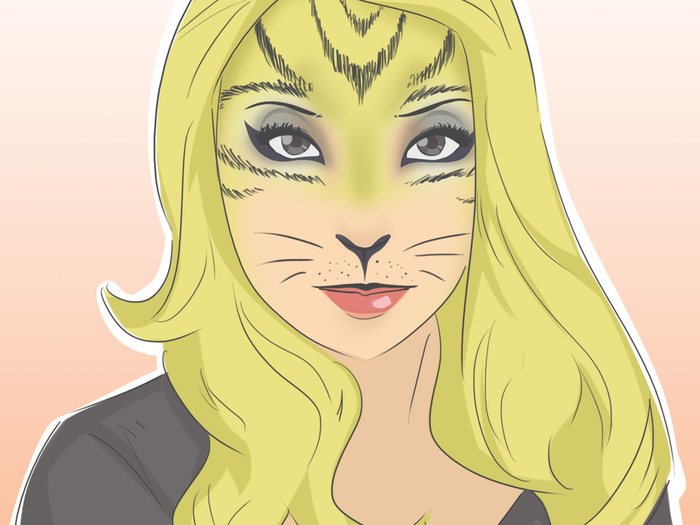 Now that you have the cat eyes and nose, you need to finish the look off with whiskers. In the area under your lip, draw small dots on both sides with your black eyeliner pencil. You can draw as many or as few as you think looks best. Once you've drawn as many as you want, draw whiskers out from the dots on the edge of your lip area. You should draw at least three, but you can draw more if you want. The top ones should point up the contours of your face, the middle whiskers should go straight out sideways, and the bottom ones should point slightly down. If you are going for a more refined look, you can leave off the whiskers and just draw the dots, insinuating the whiskers without actually drawing them. Finish off the look. All you have left to complete is your lips. You can put on your favorite color of lipstick as your base. Pink and red go well with the dark cat makeup. On top of that, take your black eyeliner and draw a line along the top of your lip. This gives the illusion of cat lips. You can also outline your entire mouth with black eyeliner, giving you a slightly more defined mouth. Add additional flare. If you want to be a particular kind of cat, such as a calico cat or even a cheetah, you can add some additional flare to your makeup to make you look more like these cats. You can add cheetah spots in black around your face or paint on black and orange stripes to add an extra layer to your costume. Pick your base outfit. Depending on the kind of cat you are, you need to choose clothes that match the kind of fur you want. 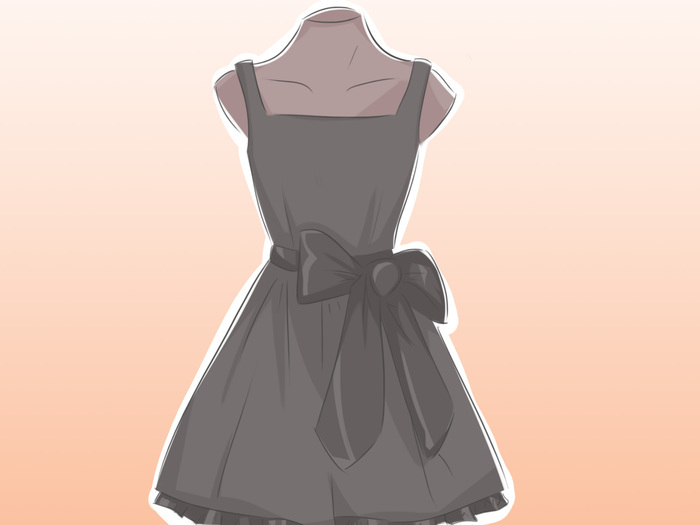 For example, if you want to be a black cat, wear a black shirt with black leggings or a black dress with black flats. If you want to be a calico cat, you can wear a white shirt, an orange sweater, and black tights to give you the spotted effect. This is the fun part. Make the costume something that you are comfortable in but that fits the kind of cat you want to be. Cut out the cat ears. 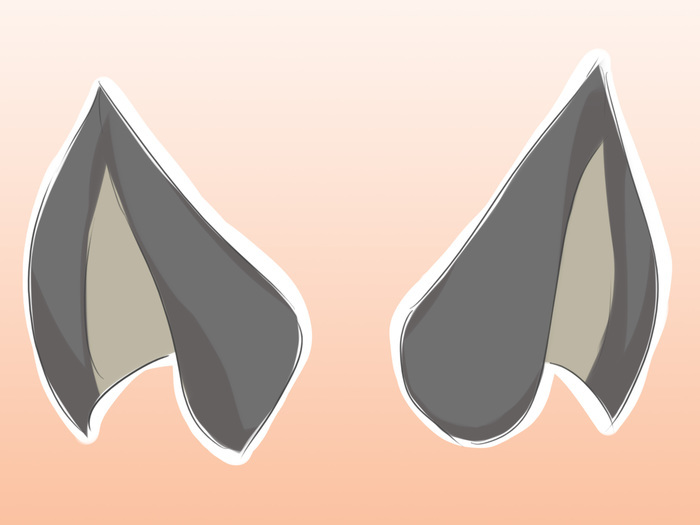 Ears are super important to the cat costume. To make your own, grab some cardboard, card stock, or other thick material. Draw the shape of one cat ear onto the cardboard, elongating the bottom of the ear by about a quarter of an inch. This will be used to make them wearable later. Cut it out. Using it as a stencil, trace around it onto the cardboard, making an exact duplicate. Cut this one out as well. Finish the ears. Once you've cut them out and you make sure they match, color the ears black, using either black paint or markers. Once they've dried, fold up the elongated strip at the bottom of the ears. Then, fold the quarter inch section in half, forming a small triangular tube when you fold it against the back of the ear. Tape the flap to the back of the ear, securing it in place. Using two bobby pins, slide one through each of the triangular tubes. Now you can attach them to your hair. When you apply them, make sure they are even in your hair. You don't want your ears to be uneven. When you tape up the tube area, make sure you cut off any excessive tape from your ears. They will look messy otherwise. The benefit of these ears is that you can style your hair in any way that you want and apply them when you're done. You don't have to worry about a headband pinching your head all night or messing up your hair style. You can also buy pre-made cat ears at a costume store if you don't want to make your own. Cut the materials for a tail. The tail of your costume can be made using any black material that you have lying around, but a pair of old black cotton tights works well. Cut both legs off the tights at the length you want your tail. One will be used for your tail and the other for stuffing your tail. Measure two pieces of floral wire a little longer than the length of the tail. Bend the wire at the ends so you don't poke yourself. Finish the tail. To finish the tail, wrap the floral wire with the other leg of the tight. Wrap the wire and tight with the first leg of the tight. Pull it snug at the bottom, making the point at the end. The stuffing should be moved around to where the rest of the tail gets bigger from the end. Using black thread, sew the edges of the tights together. Taking an extra piece of fabric or a tie from a robe or dress, sew the top edge of the tail to the middle of the tie, securing it in place. Shape the wire in the tail into the shape you want your tail. Once it's the way you want, wrap the tie or fabric around your waist and put your clothes on around it. You're costume is now complete. If you are wearing a dress and can't hind the top of the tail, try adding a belt to hide the sash. 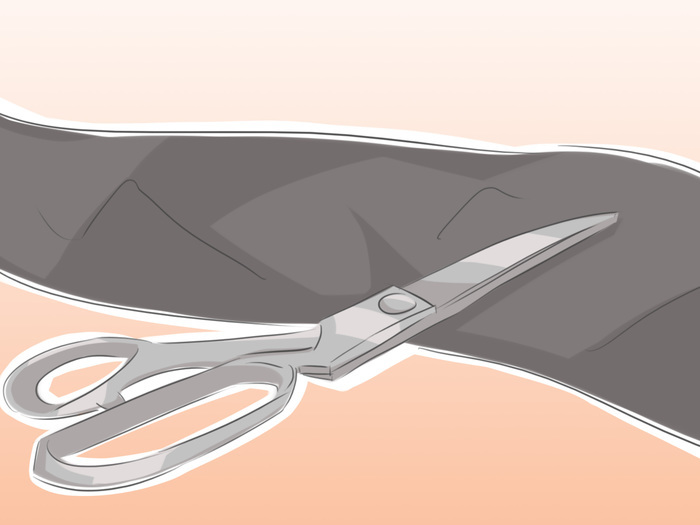 You can also skip the tie all together and simply clip it to the back of your pants, dress, or tights. The seams in your sewing don't have to be perfect. They will be on the underside of the tail and you won't be able to see them. You can also use fabric glue or fabric tape if you don't know how to sew. 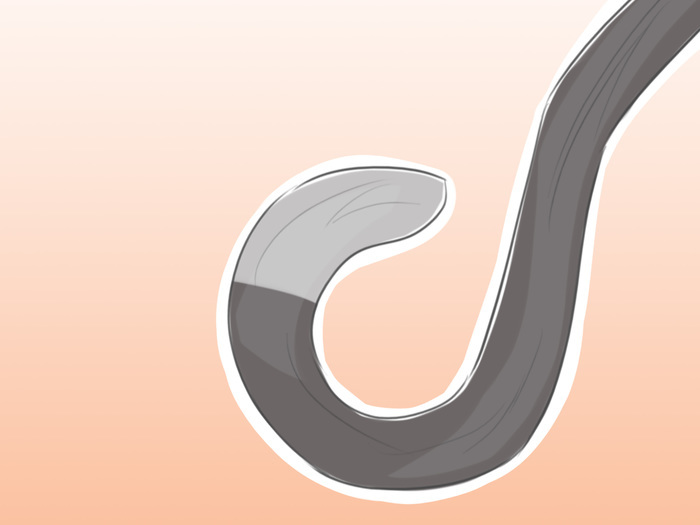 You can also buy costume tails if you don't want to make your own.